Right now, we are working on Riven and a yet un-announced app that is a bit different than other Cyan games. 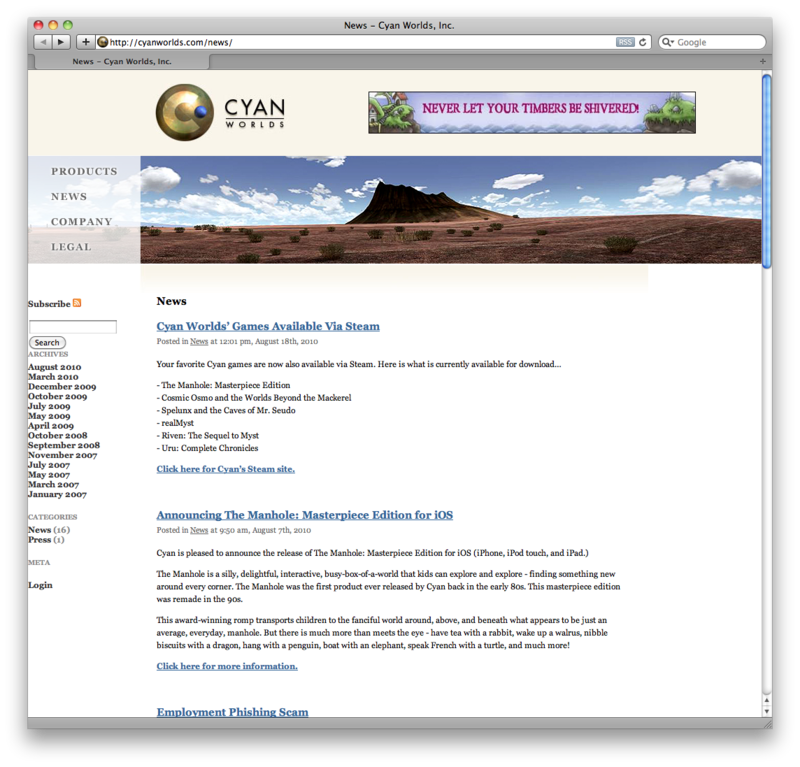 Go to http://cyanworlds.com now and see if you can find something related to that statement. Don't worry, it's not tough. Really excited about this, Cyan! Wow didn't see that coming, but yeah I'm excited to see how this works out. Do you suppose that it will actually be related to Myst as the title suggests or do you think the title is just a little nod to us fans? to the mysteries of space. so you think I'd understand. And I guess stoneship is just a work-on-progress name. Interesting. This could easily take place in the distant past or future in the same world as the Stoneship island. My first thought was that this could be related to the Black Ships, but that's from a different age, so that's unlikely. Location: the world, mostly Florida. Hey I'm up for anything new that keeps the gears turning! Sign me up! Glad to see this making the rounds. I think I'm just going to leave this here. Great music! Is that from Tim Larkin? Edit: Or no, iTunes puts Tye Hooley in for the artist. I know he's been there awhile… But new music talent at Cyan? Nothing wrong about "causal games" (if that's what it is), actually they can be hard to design, and if they're done cleverly they can be well worth it. I'm probably wrong, but I seem to remember Cyan has tried to do casual games a couple of times before and gotten stopped because their publisher wanted more Myst. Maybe they are finally getting to do what they wanted to quite awhile ago. Either way, Stoneship looks very cool. I can't wait to play it! Last edited by Malfhok on Fri Aug 20, 2010 5:11 pm, edited 1 time in total. Thanks for that link to the music of stone age Danear.